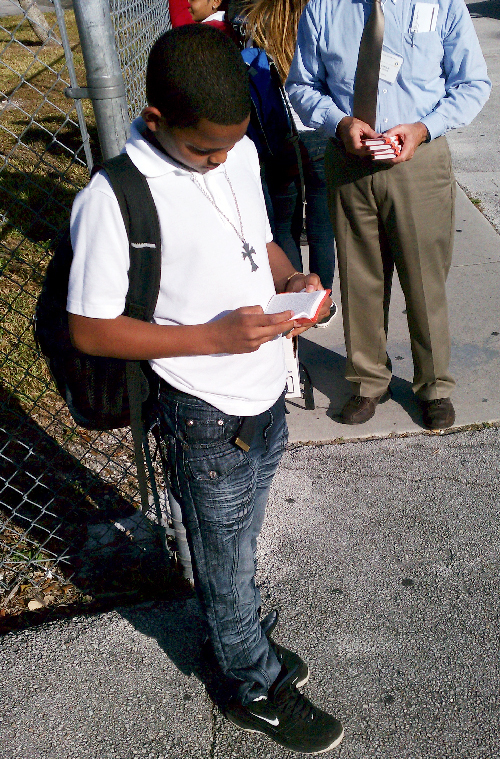 A young boy reads his copy of God's Word received during the Miami Metro Blitz. © 2012 The Gideons International. In February, over 150 Gideons and Auxiliary from the United States, United Kingdom, Mexico and South Africa joined together to share God’s Word in the Miami Metro Blitz. Along with the city of Miami, the blitz also included the Dade County area of south Florida, comprising almost 1,900 square miles. With 3.2 million residents and 12 million visitors from around the world annually, the need for God’s Word is great. For more than 30 years, the University of Miami has been closed to Scripture distributions. But local members have prayed faithfully for an opportunity to reach those students. Prayers were answered in God’s timing as Gideons were finally able to distribute God’s Word on the campus. Members were given specific instructions regarding distribution, prefaced with the caveat that this was a spiritually dead environment. Nonetheless, to the delight of those carrying out the distribution, over 1,000 people received a copy of God’s Word that day. Students, staff, and campus guests willingly received New Testaments, and many stopped to seek more information and express their gratitude. One particular young woman was involved in Zen and became very interested when a local Gideon shared with her about the Bible being the true source of wisdom. Approximately fifteen miles away, two team members arrived at Miami Dade College – South Campus. They found tables and chairs had been set up in a low-traffic area. Only a few students came through. But God brought exactly the number He wanted. A team member shared, “He gave me confidence and the words to witness to students in a way that I have never experienced before. I was blessed to lead eight of the students to acceptance of Jesus as their Lord and Savior.” One young man said he was Muslim, one professed Buddhism, three claimed to be Catholic, and the others had no real spiritual beliefs at all. He discussed with the students what it meant to be a sinner, and explained our access to God’s unending love and the grace offered to us through Jesus. While no student was the same, they all had the same need—Christ as their Savior. 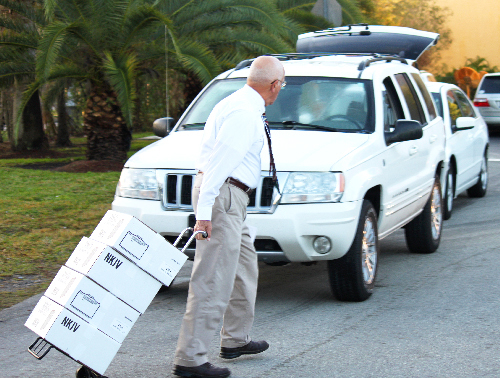 A Gideon loads Scriptures for the day of distributions during the Miami Metro Blitz. © 2012 The Gideons International. While the team watched prayerfully, the intrigued students began approaching them to see what this was all about. Gideons began offering New Testaments, and as word spread, more and more students came to get their own personal copy of God’s Word. Several parents thanked the team for being there and doing what they were doing. What could have been meant for evil, God meant for good. At a doctor’s office, a woman became very emotional after receiving a New Testament from an Auxiliary member. The woman went on to explain that she had been an addict but had been clean for 14 months. She began to cry and expressed that Christ was exactly what she needed. The Auxiliary member took her through several verses in the back of the Medical Testament, and the tearful woman prayed to receive Christ right then and there. By God’s provision, 108,213 Spanish, English, and French Scriptures were placed and distributed during this one-week blitz. Lives were impacted through the direction of the Holy Spirit and the activities of members from various cultures and walks of life. However, the opportunity does not end. Titus 3:7 reminds us that, “…having been justified by His grace we should become heirs according to the hope of eternal life.” People in Miami and all across the world are still searching for the hope that we have to offer through Christ. Great work guys!! I know God will bless all your efforts and will bring about His purposes through your faithfulness to serve Him through this ministry. We look forward to hearing more testimonies out of Florida from this blitz!! I must admit that I am surprise to read the comment about the University Miami as “spiritually dead” environment. It looks like we must pray the more. Praise the Lord that there was good reception. It is really hard to think about what it means for a school to be closed to Scripture distribution… think of the people who did not get a chance to get the Word! And we should remember to pray that places that are closed would be opened! Thank you Gideons for reminding me that God’s Word LIVES! #2 – “I can’t wait to get to heaven and give Jesus a great big hug and say “THANKS A MILLION”. Wow, how precious. Then out of the blue last week, my 13 year old daughter came home with the most beautiful orange teen style”New Testament” Psalms & Proverbs, froom “The Gideons”. Oh how the holy spirit works. “They were handing them out at Jr. High after school!!! I instantly praised the lord and made a promise that I would start giving to”The Gideons”. God made my dad’s earthly death a reminder how much we need the new testament & it came full circle and I want to Thank you from the bottom of my heart for your dedication, making sure that every one has a bible. (Note: this was in Brea, CA) I have sent my donation to you. Thank you Denise! Blessings to you today! We work sharing the good news here in Miami, and in Central America from time to time. I wonder if you can help me with this .